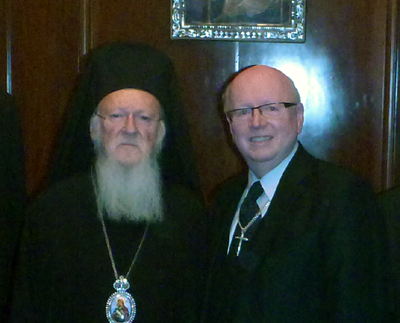 Dr. Geoff Tunnicliffe, Secretary General of the World Evangelical Alliance (WEA) recently met with the Ecumenical Patriarch of Constantinople, Bartholomew I, in Istanbul, Turkey. Together they discussed the current crisis and the plight of Christians in Syria, Iraq and the Middle East region. A specific emphasis of the conversation was on the importance of responding to the increasing number of refugees, ensuring their protection in the short-term and creating ways for them to later return to their homeland. “This was an important meeting where we able discuss areas of common concern. We spent a considerable amount of time discussing the current crisis in the Iraq and Syria where thousands of Christians as well as other minorities are at great risk. We agreed this was an important moment for the global church to stand united with our brothers and sisters who are facing great hardship,” said Dr. Tunnicliffe. The meeting was built on a long-term relationship between the WEA’s Theological Commission and the Patriarch, who represents some 300 million Orthodox Christians in the world. In recent years, the WEA and its International Institute for Religious Freedom have also been very active in defending the rights of the Ecumenical Patriarch and Orthodox Churches in places where they faced persecution. Dr. Tunnicliffe was accompanied by members of the Theological Commission, Dr. Thomas Schirrmacher and Dr. John Baxter-Brown. Together with leading theologians of the Patriarchate, they started conversations on formalizing the dialogue into an in-depth long-term working group that will establish what evangelicals and Orthodox Christians have in common, and where they disagree.